4 of "The Button" Pants or Skirt Expanders for $12.49 - Fast and Free Shipping with Delivery Confirmation! Fast Shipping in U.S and Internationally. over the Collins product Below! While we sell the Collins, We believe this is the best product on the market and its reasonable priced. 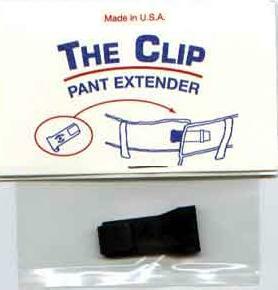 4 of "The Clip" Pants or Skirt Expanders for $12.49 - Fast and Free Shipping with Delivery Confirmation! Made by Collins. While we carry this item , We recommend the " The Button " above.